Have you been keeping up with the World Cup? Every four years, the World Cup attracts soccer lovers from around the world. Soccer is one of the most popular sports on the planet, with more than 240 million players and over three billion fans. As the sport’s popularity grows, so does its injury rate. 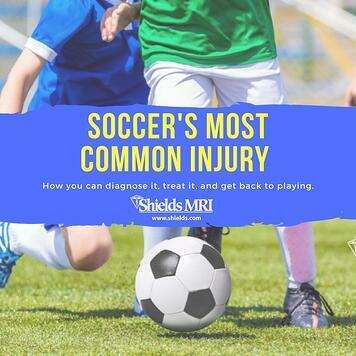 Whether it is one of the best players in the world, or your 10-year-old son, soccer players are subject to lower extremity injuries. One of the most common injuries in soccer is an ankle sprain, which makes up approximately 25 percent of all sports-related injuries. An ankle sprain often occurs with a fall or a roll of the ankle. Your ankle contains lateral ligaments that support the ankle joint and attach the bones to one another. When you experience a fall or unnatural twist of the ankle, these ligaments can be pulled past their normal range of motion and cause a strain or even a tear. The ligaments allow the ankle to move in many directions, but they have a certain limit to how far they can be stretched. The severity of the sprain can be diagnosed as a grade I, grade II, or a grade III sprain, depending on how irritated the ligaments are. How can I treat an ankle sprain? An ankle sprain can often be treated at home with rest, ice, and pain relievers. It will often stay swollen and sore for a few days; however, if the pain remains the same or worsens you should see a doctor. Ankle sprains range in severity, and what is thought to be an ankle sprain could also be a torn ligament or broken bone. If a doctor suspects something more severe than a light sprain, he or she may advise you to get an X-ray and an MRI to look for a more serious injury to the bones or surrounding ligaments and tissue. If an MRI is prescribed, visit one of Shields’ locations to receive top-of-the-line imaging with technicians who can get you on the road to recovery. Always stretch before working out or playing a sport. Strengthen the muscles around your ankle joint if you have weak ankles. Wear an ankle brace or have a professional tape your ankle joint if you have a history of ankle injuries. Always be careful of running on uneven surfaces. Can an untreated ankle sprain lead to long-term injury? If an ankle sprain is not treated properly, it could worsen or recur. Once an ankle sprain occurs, if it does not heal properly the muscles around the joint can weaken and the likelihood of your experiencing an ankle injury in the future will increase. It is important to receive the right treatment and ask your doctor whether physical therapy or a supportive ankle brace can help protect your ankle in the future. How can an MRI diagnose an ankle injury? If your doctor recommends an MRI, it is important to get the imaging done to see whether there is any serious tissue damage. Oftentimes a more severe ankle sprain, or grade III, needs to be treated differently than a grade I or II because the ligaments need more time to heal and physical therapy may be required. Without an MRI, it is difficult to determine the severity of the injury, and it may be treated improperly. In addition, returning to physical activity too soon could damage your ankle joint permanently. What will an MRI cost for an ankle sprain? MRI costs vary depending on the type of scan and the facility where you receive your care. Shields MRI has 30 facilities across Massachusetts, New Hampshire, and Maine – and all of them offer the gold standard in MRI technology and the very best value. This particular MRI would fall under the category of a “lower extremity” scan, and with insurance can cost as much as $1,200 - $1,400 at a higher-priced hospital. To give you an idea of the savings you’d experience at Shields, for the same scan, the average price for this MRI would be about $800. As with all health care, these rates are not guaranteed and will be based on your insurance coverage and your specific plan. If you have any questions about price or would like an estimate for your scan, we encourage you to visit our online savings calculator or call 877-712-3075.